An international consortium of scientists studying gamma-ray bursts (GRBs) as part of the POLAR (GRB polarimeter) experiment has revealed that high-energy photon emissions from black holes are neither completely chaotic nor completely organized, but a mixture. The results were published in the online version of Nature Astronomy. GRBs are short and intense bursts of gamma-rays, which suddenly appear from deep space but randomly in direction and time. They are the brightest explosions in the universe since the Big Bang. Although discovered more than 50 years ago, the nature of GRBs is still poorly understood, especially what powers the explosions. Studying GRBs is important to understand how massive stars end their lives, black hole formation and the most relativistic jets in the universe. The current study is based on high-precision polarization measurements for prompt emissions of five GRBs recorded by POLAR. The results show that within short time slices, GRBs are found to oscillate in the same direction, but the oscillation direction changes with time. POLAR was launched on board the Chinese space laboratory Tiangong-2 on Sept. 15, 2016. A total of 55 GRBs were detected and confirmed within about six months. The five GRBs currently reported are part of this group and represent the largest ever high-precision sample of GRB prompt emissions. In order to understand the GRB prompt emission mechanism, many different theoretical models have been proposed, with different predictions of the polarization properties of GRB prompt emissions. The analysis of the five GRBs in the current study shows that the average polarization degree (~10%) is not as high as some GRB models predicted. In addition, a new finding of the evolution of the intrapulse polarization angle provides us with a new insight into the microcosmic world of GRB physics. Measuring the prompt emission polarization of GRBs is important because it may provide information about relativistic outflow geometry and magnetic field structure. Such measurement is quite difficult, however – one reason few successful measurements were made before POLAR. The POLAR team at the Institute of High Energy Physics (IHEP) of Chinese Academy of Sciences will continue the analysis of POLAR data. Looking to the future, scientists from China, Switzerland, Germany and Poland have formed an expanded collaboration team to develop a much more powerful polarimeter, POLAR-2, as the successor to POLAR. POLAR-2 would be part of China’s future Space Station. It would address scientific questions raised by POLAR and hopefully lead to a better understanding of GRBs. POLAR is the first GRB polarimeter with a large effective area, large field of view and high precision. 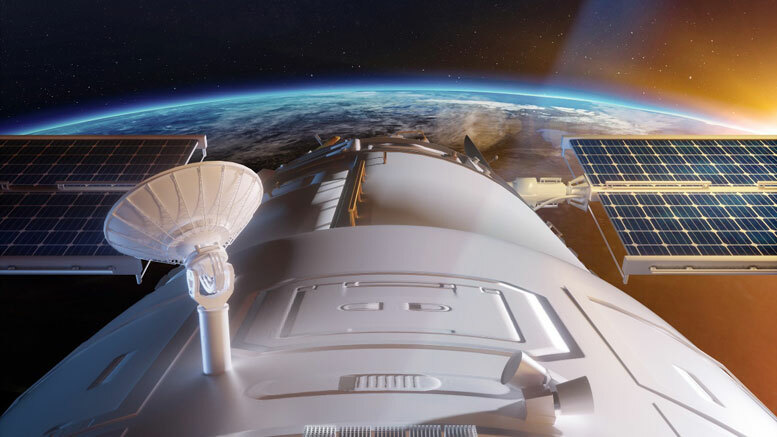 It is the result of great effort by researchers from China and Europe, collaborating on instrument development and proper ground and in-orbit calculations. The POLAR collaboration was formed 10 years ago by scientists from IHEP, the University of Geneva, the Paul Scherrer Institute and the National Center for Nuclear Research in Swierk, Poland. IHEP is the leading institute for the POLAR experiment in China. The POLAR project has been supported by the China Manned Space Agency, the Ministry of Science and Technology of China, the National Natural Science Foundation of China, the Chinese Academy of Sciences, the Swiss Space Office of the State Secretariat for Education, Research and Innovation, and the National Science Center of Poland. Be the first to comment on "Scientists Reveal Orderly Chaos of Black Holes"